The openly anti-Semitic Jobbik party comes second in 18 out of 19 counties in local elections. The openly anti-Semitic Jobbik party in Hungary has made gains in local elections won convincingly by Prime Minister Viktor Orban's ruling nationalist Fidesz, the BBC reported on Monday. "From 2018, Jobbik will govern this country," Jobbik leader Gabor Vona was quoted as having told cheering supporters in Budapest as the election results came in. 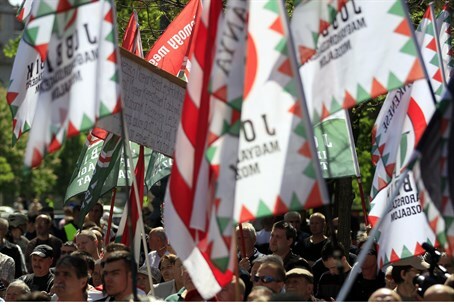 The party is behind much of the anti-Semitism in Hungary in recent years. This summer, a town mayor linked to Jobbik was filmed ordering the hanging of effigies of Israeli Prime Minister Binyamin Netanyahu and former president Shimon Peres in protest against the Gaza conflict. In April, Jobbik came in third in the parliamentary elections and took a 20.5 percent share, up from 16.7 percent in the last election in 2010.